Since my return from the orientation in Toronto in January, I have been staying with my parents in southeastern Washington state. 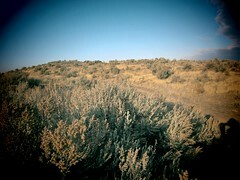 Recently on a trail, I ran among the dry sagebrush steppe and contemplated the desert and my lenten journey. How do I form and hold onto a spiritual practice for lent as I continue to wait in this liminal space? I haven’t answered that yet. All of my belongings not going with me are packed away, leaving me to that which I can carry. I don’t have to take time out of my busy day to think about lent—I have time, lots of time. Well, the newness of waiting has worn off, and as the weeks pass by, it has become increasingly difficult to retain my earlier reflection on the deliciousness of ambiguity. So, it seems, as the liturgical season turns, so has a season in my spirituality. But this desert isn’t desolate. Over the weekend, I returned to Seattle and said goodbye to my parents. And yesterday evening my church community, Church of the Apostles, blessed my waiting. In our nearly 10 years of existence (I’ve been around for 7 of that), we have laid hands upon many to bless their various journeys near and far. As it is not yet time for me to leave the country, I asked for prayer in my waiting. Standing in this liminal space, and surrounded by my community, hands were laid upon me to bless my waiting. Today I wonder: what will this week of waiting and wandering bring? ← I’m still waiting, so why not run a half marathon?